We would like to apologize in advance to anyone who has to face Aroldis Chapman during the remainder of the 2010 season. Clocked at 103 mph, Chapman made his major league debut on Tuesday night throwing only eight pitches as he retired the Milwaukee Brewers in order during the eighth inning of the Reds' 8-4 victory. Cincinnati's win, coupled with a 3-0 St. Louis loss to the Astros, placed them a season-high seven games ahead of the Cardinals in the NL Central standings. 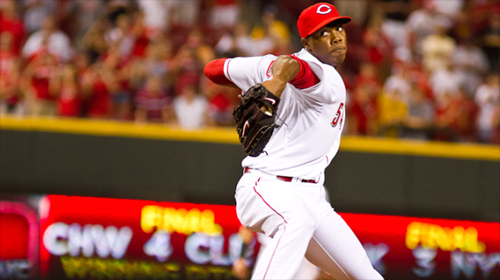 "To pitch in the playoffs for the Reds would be great for me," Chapman said. Aroldis Chapman's first major league pitch was a 98 mph called strike to Brewer's catcher Jonathan Lucroy. In front of just 19,219 fans at Great American Ballpark, Chapman was just heating up. Seven of Chapman's eight pitches were strikes as he hit 100-103 mph with his fastball, 86 mph with his cutter, and 87 mph with his slider. Chapman's slider, not his fastball, was the pitch that caught Reds' catcher Ryan Hanigan's attention. "That thing … that pitch … that’s a whole different ballgame," Hanigan said. "His breaking ball is what people should be talking about. His slider is absolutely ridiculous. He’s got to be able to throw it for a strike and he’s got to get into counts where we can call it, so getting ahead is big, but if he can throw that breaking ball for a strike… good luck. It’s a hammer. I saw it in Triple-A, it’s 88-to-93, it’s moving about a foot and a half. That’s not something that anyone wants to hit, I don’t care how good you are." Already performing in high gear, the Cincinnati Reds will flourish with the arrival of Aroldis Chapman. The Reds' secret weapon has been unleashed. Francisco Cordero had never seen 102 mph on the scoreboard before. "I've never seen anything like it. I've got that," Cordero said, "in my Ferrari."